Spin Distribute - Article Distribution System - Publish hundreds of unique articles to 800+ websites using our Article Distributor! Are you still paying for most of your traffic? 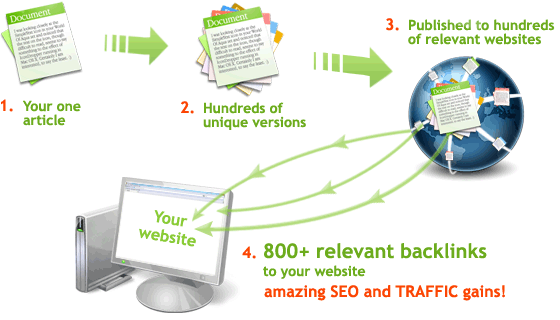 Or struggling with 50 daily visitors you get from search engines? Well, we were once in the exact same position - and we decided to put a stop to that. Let me tell you how. Over the last 18 months we have been working on a unique article distribution system that will generate more than 800 highly relevant links to your website for each article you submit. This means, you take one article, and you use our article distribution system. It will generate thousands of unique versions of your article, and publish those unique articles to hundreds of websites that are related to your niche. So, imagine this: There are hundreds of higly related websites that have content about your niche, and they ALL link back to your website. Search engines will say "wow, this must be a dominant site in this niche!" and they will push you to the top of their search results! They say that a picture is worth a thousand words. Take a look at the picture on the right - this is the traffic growth we achieved in just over 2 months of using SpinDistribute Article Distribution System. 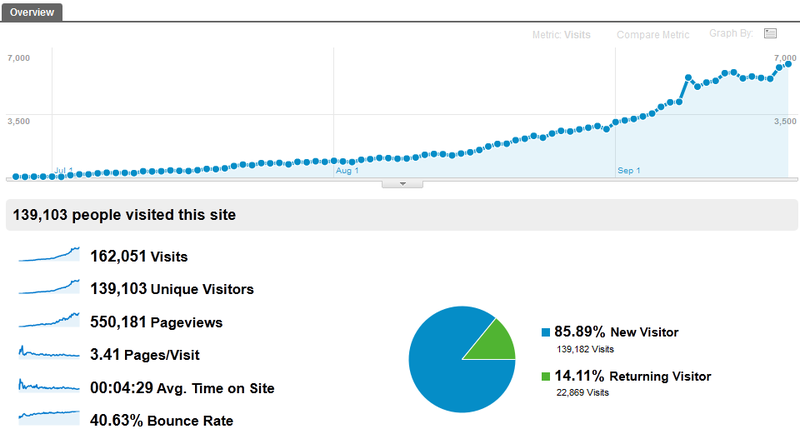 Just 3 months after launching this website we had 7,000 laser-targeted free visitors every day. Now, how would you like that? QUICK MATH: Say you have 7,000 daily visitors on your website. You get 20% of them (1,400 visitors) to subscribe to your mailing list and you convert 2% of your mailing list (28 visitors) to customers for your $77 product. Well, you are making over $2150 each day! Almost a seven figure revenue each year - and it can all happen in 3 months! new SpinDistribute account. You can always change your password later. Still not sure about all of this? And what are our clients saying about this article distribution system? Why would you use our system and not something else? Well, you have to know that we were using other systems before we created our own. And what's more than that - we created our own article distributor exactly because we weren't satisfied with those other systems. » or you figure out that they are using a script that's only working for one type of article directories, and your articles end up on a large number of websites that are basically the same. And if they somehow do get both those points right, well, they usually submit the same version of your article to all websites in their network. And that sure doesn't seem natural to the eyes of search engines, and doesn't do you much good. » submit a unique version of your article to each website in our network! And of course you get a BONUS with you free registration! Q: Can you write articles for me? Absolutely, we will provide you with distribution-ready articles if you wish. We formed a partnership with a company that is strictly devoted to article writing and they have a team of 30+ writers, all native English speakers. They do thorough research before writing any number of articles, and so far our customers have been impressed with the quality of their work. Q: So, what article directories do you submit to? Simply click here to see the list of some of the Article Directories that we distribute your articles to. We also distribute your articles to a large number of blogs and other content-rich websites. Q: I still have so many questions, what to do? Well, you can check out the FAQ section of our website, or you can read a longer explanation of our system. You can also create your free account and use our Live Support. Or you can drop us an email, any time. So, if you are serious about your online business, give us a try. We certainly wish you all the best in your business! As you know, we decided to offer a unique article distributor to all internet marketers out there. With our service you can take one of your articles, create 800 absolutely unique versions of this article and publish it on 800 highly related websites to gain the best possible exposure. And because the published articles are unique, Google and other search engines will find them much more valuable and your backlinks will bring you more "link juice". And you are able to get each of your articles distributed in a few minutes! Heck, we can even write all the articles for you, so you can focus on other parts of your business. "We are sure that our tips will help you. If you want to make a really good decision, go with us." "We are [sure|confident] that our [tips|hints|advice] will help [you|your business]. If you want to make [a really good|a great|the best] decision, go with [us|our company]." and submit your article. The changes you have made allow our article distributor to create 72 different versions of this short paragraph. With a 500-word article we would get billions of unique versions, so you don't have to do nearly this much changes for practical use! With only 10 pairs of brackets with three alternatives in your article you instantly get 310 = 59,000 different articles. After you submit your article for distribution, we will review it in 24-72 hours. If there is nothing wrong with the article, we will proceed to send it out to 800 different highly related websites in the next couple of days to gradually obtain hundreds of valuable and relevant backlinks. You can even choose the length of the distribution period for each article. This means you can generate links to your brand new website at a slower pace at the beginning with a 50-day distribution, or promote your well-established website with a really fast 4-day distribution. You can imagine why this works so amazingly well. Google sees tons of unique content, all writing about your product and linking to your website. Obviously your website must be really important in your niche and it deserves to be on the first page of search results! And this is exactly what SpinDistribute Article Distribution System gives you!